Height: 4.50". Width: 4.25". Thick: .020. Weight: 0.056oz. Stamped steel. Colors shown: Body: Metallic greens, white, red throat. Wings: Metallic slivers, whites, browns. Beak: Black. 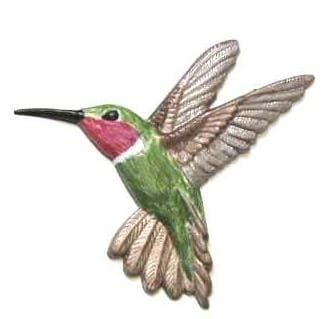 The hummingbird will make nice hand-painted gift for any bird watcher.